Clear sound quality at very high levels with amazing 1000W output. 1080P Full HD video quality and SD videos to high definition quality upscale. Slightly bulky. The latest powerful 5.1 channel home theater system Sony BDV-E3100 is our pick of the day for the comprehensive review. This hot selling model from reliable quality home electronics maker has got thousands of positive feedback from worldwide users. The sound quality of this system was amazing and this model also has few great features which makes it worth for its price tag. There is huge competition on home audio system market but Sony products are one with reliable quality and service life. Performance of this home theater system was brilliant both in terms of video and audio quality. Sony offers best experience for its users by making use of latest technologies in this model. SD quality videos from regular DVD are up scaled to near Blu-ray quality display by this system. Both SD and HD videos are played with amazing picture quality through this technology. This model also supports 3D Blu-ray movies, get your 3D glasses and be ready for an enthralling feel of 3-Dimensional movies. Along with good picture quality, this model has best-in-class audio support. It has ultimate specifications in terms of audio output power. The 5.1 channel comes with total 1000W output power. Each channel’s output power is proportioned to bring best surround sound effects. Cinema hall like feel is rest assured with this top class specification. The sound quality was very good even at high volumes, it produced clear crisp sound with perfect bass. Surely this system will make you a music addict, if you’re not the one already. The electronics giant also added many good features on this model at affordable price. The system has built-in WiFi, NFC and Bluetooth features. No need to mess-up with wires, media files stored on other gadgets can be played with ease. Its One-touch technology comes handy while playing media files stored on your smartphones via Bluetooth or NFC connectivity. Not just downloaded files, the system supports many online streaming services like YouTube, Netflix and Hulu etc. You can play streaming videos from these services directly on TV. Sony BDV-E3100 has many other good features compared to its peers and the price is also set at very attractive level. Considering all these features, its performance and built quality, we recommend this product is worth for its price tag. 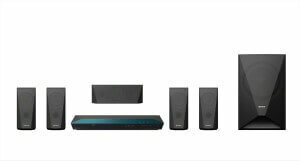 If you are looking for a best audio/video output quality home theater system at a reasonable price, this one is good to consider buying. Surely this model will deliver more than your expectations and gives amazing home cinema experience.